In the winter of 2017, Happymon Jacob was eating fish in a Pakistani mess in Muzaffarabad. Everyone else was, too, because he did not eat meat. Since he had only recently given up meat, he wondered how they knew. “We know all about you,” he was told. Jacob, a well-known academician and one of the brightest young strategic thinkers in India, crosses over to Pakistan, or ‘enemy’ territory, as it is to some, for an “intellectual pilgrimage’’. 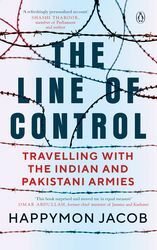 The Line of Control: Travelling with the Indian and Pakistani Armies is the result of this adventure. It took him two and a half years to get permission to go to the Pakistani side—and it was worth it. Thankfully, his account of his journey across the Line of Control (LoC) is devoid of the isms that dominate any conversation in India about Pakistan—patriotism and nationalism. Memorable, fresh and neutral (a word that hardly ever features in a discourse about Pakistan), Jacob does what movies and music have been trying to do for years—humanise the other. It is a formidable task, especially when it comes to the fauj (Army). Yet, Jacob does it admirably. His book brings alive members of the Pakistani fauj—like Major General Azhar Abbas, the Murree-based 12 Infantry Division’s General Officer Commanding (GOC), who refuses to smile and smokes through the one-and-a-half hour interview. And even the former defence secretary, Tariq Waseem Ghazi, a ‘hardliner’ according to India. But more than just an experience of peace, Jacob takes the reader on a journey to ground zero from that fabled, most vilified place—the LoC in Pakistan. And, of course, in India. Delightful, peppered with anecdotes, wry, often witty and always amusing, crossing over to Pakistan comes laced with a forbidden thrill comparable to the smuggling of alcohol across the border—something Jacob has done successfully a few times. Or drinking it, as he says, in Lahore. He captures perfectly how fascinating Pakistan is, especially to someone who has spent years writing intimately about it from across the border. Driven by curiosity—academic as well as personal—Jacob paints a picture of this mythical, vilified line to tell stories of those who guard it on both sides. He is the perfect and experienced guide, having been to Pakistan with former Pakistan president Pervez Musharraf and former chief minister of Jammu and Kashmir, Mehbooba Mufti. Brave and often funny, Jacob keeps the reader engaged. This is essential reading for those who are flag-bearers of peace. And more so, for those who are not.